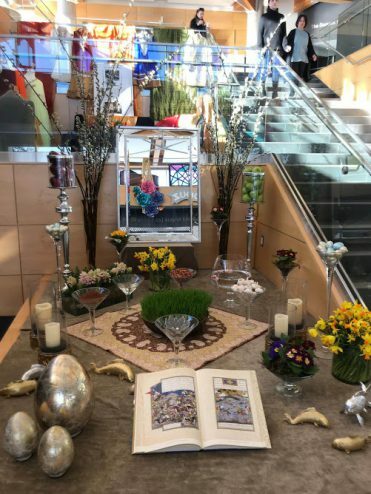 Its Persian New Year! 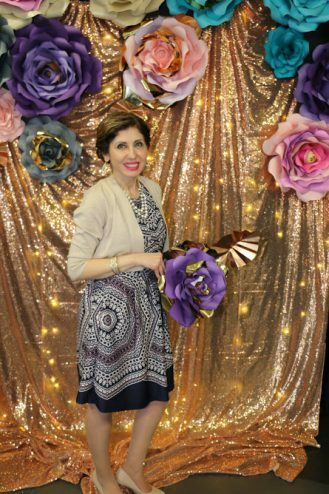 I was invited to join the lovely Persian Community at school to lead the decorations. I wanted to incorporate elements of Iranian culture, and focused on arch-shaped apertures used in architecture. 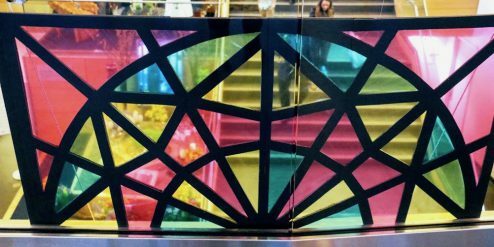 I was also inspired by the use of stained glass and geometric design, as well as the curved form of the ‘Buta’ or Paisley motif. 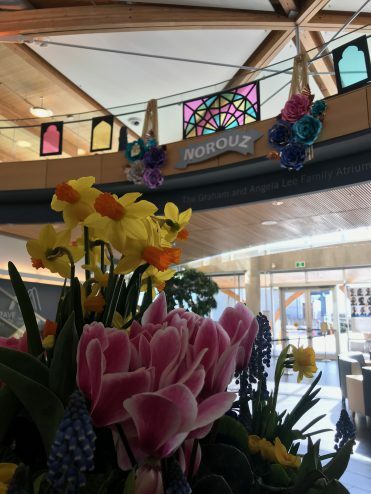 I chose a joyful Spring colour palette of Pink, lilac, blue, green and yellow, which would be reflected in the lush floral arrangements scenting the halls and grand staircase. As usual I had to translate my research and initial sketches into elements that would be able to be produced quickly and with inexpensive materials. 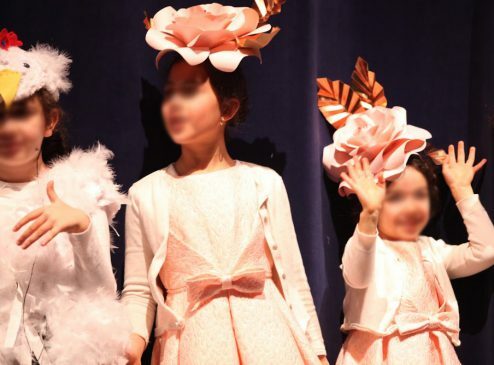 Ideally it would also incorporate a way to involve parent volunteers (who are enthusiastic to help, but often not confident in their creative skillset.) The halls we were to decorate are vast with imposing high ceilings, so the scale would have to be something large enough to make an impact. I made arch shapes in two designs inspired by different periods in Persian architecture. Cutting black foam core with Exact-o knives to create the apertures I was careful to make neat cuts so that the negative shapes could also be used to create panels. 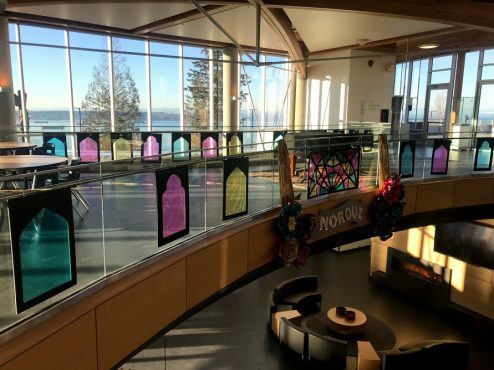 I added coloured cellophane, sandwiching two panels together so they were neat from both sides, and hung around glass walkways, making use of the natural light to create colour and reflection all around. The cuts were too tricky for helpers but I was able to involve people in adding the cellophane and nylon hanging thread. I made a special centre panel in a geometric design and multi-coloured cellophane, which was time-consuming but satisfying work. For a centrepiece I drew a banner freehand and my lovely friend Karen cut it with a jigsaw in thin plywood and painted it grey. I made two of these to hang and added lettering with gold accents and pastel colours, with a beautiful silky rope to hang. 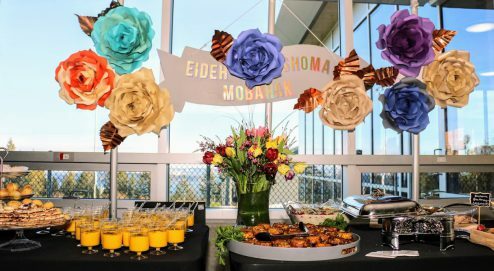 To add further colour and dimension I made scores of large scale paper flowers to decorate the school, arranging them on foamcore panels to hang, and to bookend the wooden centrepiece banners. 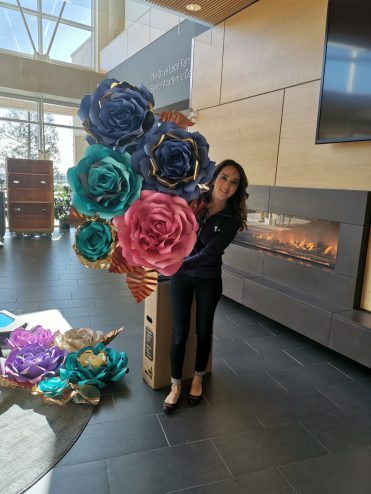 These were great fun to make, and I was able to involve parents in cutting petals, by handing out packs of card with paper templates. 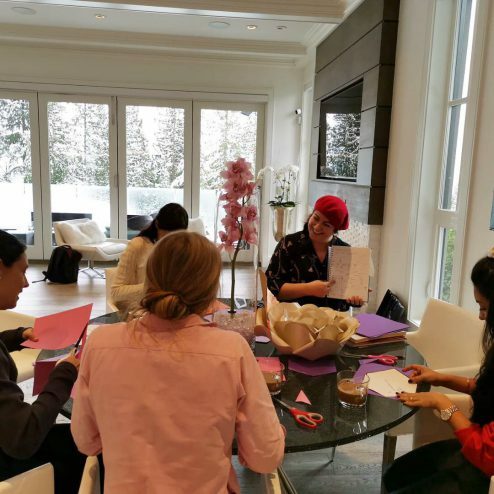 I also held two workshops to create décor elements hosted in parents’ homes which were great fun social occasions. 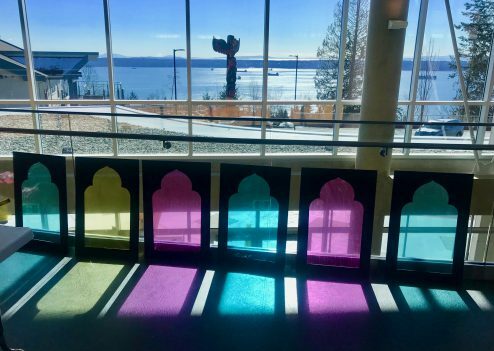 I worked with an amazing group of women who were preparing traditional and contemporary haft-seen displays throughout the school to coordinate with the décor. 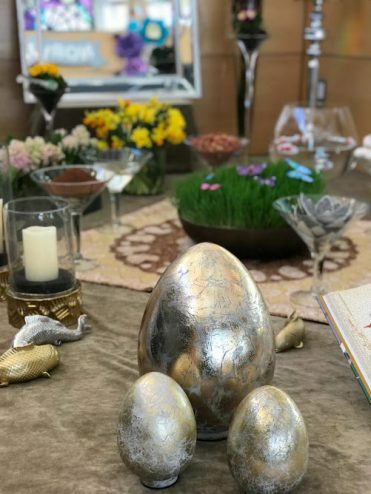 ‘Haft-seen’ is a tabletop layout traditionally displayed at this time of year in Iranian homes with elements of auspicious symbolism such as wealth, health and wisdom, with seven elements beginning with the Farsi letter ‘seen’. 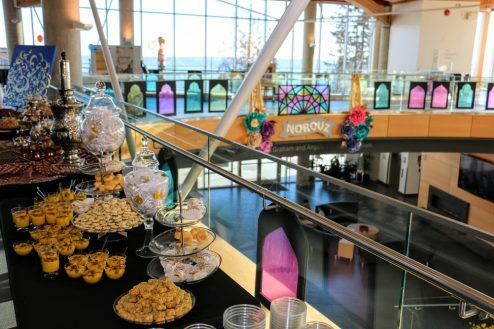 I love how the displays coordinated with the colour palette and how butterflies and birds were added as accents for Spring. 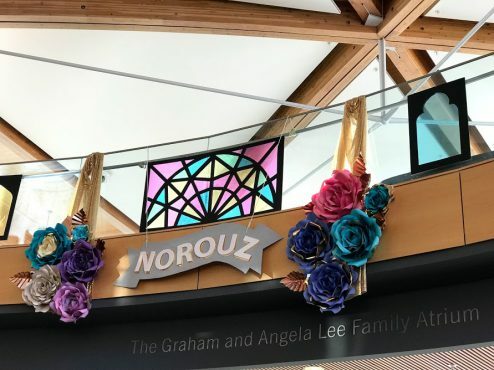 The Norouz festivities culminated in a wonderful event at school, with music, theatre and high tea. 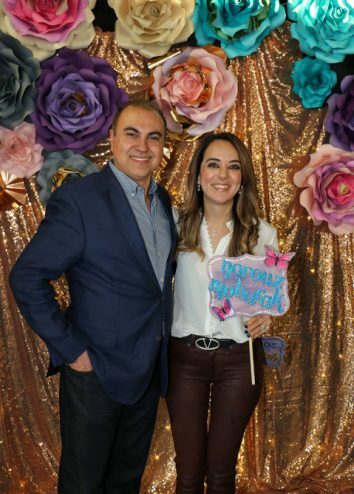 For the evening I used a sparkly rose gold backdrop and lights with the flowers to make a photo booth , with coordinating signage. 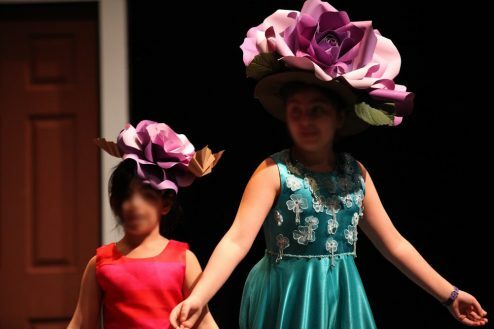 I also created four flower hats and headband fascinators for the budding (ha) thespians in the school play ! I thoroughly enjoyed working on this project and becoming friends with a lovely group of women. 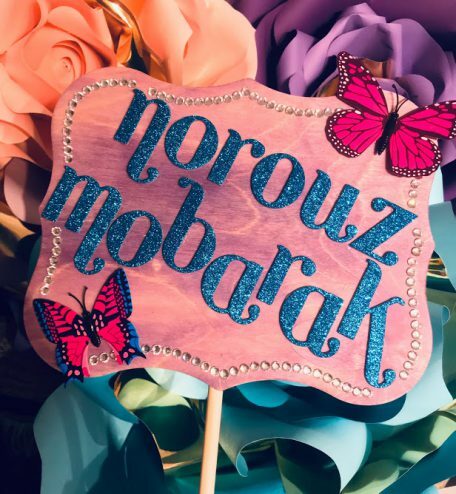 Norouz Mobarak, everyone!